Over the years, Shakespeare’s Macbeth has attracted some of cinema’s heaviest hitters: Orson Welles, Roman Polanski, Akira Kurosawa (whose Throne Of Blood transposes the play to feudal Japan). It has now also attracted Australian filmmaker Justin Kurzel, who—on the basis of the evidence here—isn’t likely to attain quite such a lofty place in the medium’s history. Kurzel’s sole previous feature, The Snowtown Murders, is a nasty piece of work about one of his country’s most notorious serial killers; his next project, due Christmas 2016, will be Assassin’s Creed, based on the video game series. In short, he’s into violence. Macbeth is certainly Shakespeare’s bloodiest tragedy, but the extent to which Kurzel’s adaptation subordinates the poetic to the visceral makes Polanski’s grim, muddy 1971 version look as frothy as Much Ado About Nothing by comparison. We’re talking maximum sound and fury, and while no movie that stars Michael Fassbender and Marion Cotillard could signify nothing, this one doesn’t signify a whole lot. Right off the bat, Kurzel takes advantage (as he should) of the camera’s greater freedom, actually staging the pitched battle that takes place just before the play begins. 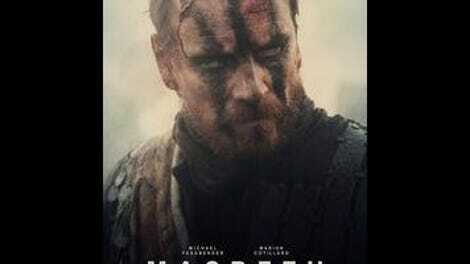 Macbeth (Fassbender), a general, is first seen decked out in Braveheart-style war paint, snarling and grimacing—it’s a fearsome image, but one that makes the character’s subsequent descent into murderous ambition feel considerably less tragic. After his encounter with the weird sisters (less weird than usual, oddly), who tell him that he will be king, it hardly seems necessary for Lady Macbeth (Cotillard) to prod him into killing Duncan (David Thewlis), given the inhuman ferocity he’s already displayed on the battlefield. But, then, Kurzel isn’t especially interested in psychological nuance—not when there’s extremely realistic stabbing to be done. Shakespeare’s verse is treated largely as an afterthought, as if all those Elizabethan words are getting in the way of the action. Kurzel seems to think that the play has endured for centuries simply because it’s so badass. Why this bare-bones adaptation required three screenwriters—Jacob Koskoff, Michael Lesslie, and Todd Louiso—is something of a mystery. They take a number of liberties with the text, some of them effective (like having Duncan’s murder witnessed by his son, Malcolm, played by Jack Reynor), others considerably less so (e.g., omitting Macbeth’s second visit to the sisters, and their misleading reassurance that he will remain king until Great Birnam Wood comes to Dunsinane Hill and that “no man of woman born” can kill him)*. Ultimately, though, this Macbeth belongs neither to Shakespeare nor to the actors. (Fassbender and Cotillard are solid, if hardly revelatory; Paddy Considine makes a nicely dolorous Banquo.) What lingers in the memory is the opening battle, and the quick bursts of brutality, and the screen becoming tinged blood-red at the climax. 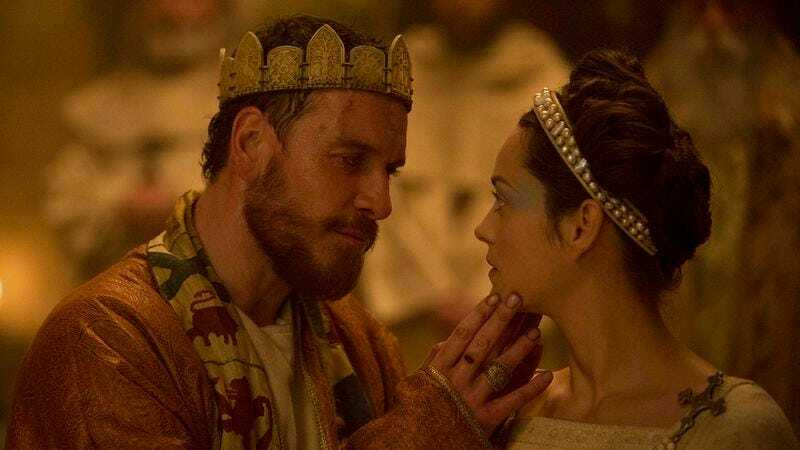 Directing a Shakespeare movie in order to audition for the job of helming Assassin’s Creed seems ludicrous, but with both Fassbender and Cotillard also starring in the latter, it almost appears as if that’s what happened. Hopefully, that means Kurzel has found his proper element, and can indulge his penchant for hacking and cleaving, minus all that pesky soul-searching. * See comments. It seems highly unlikely that this scene was in fact omitted—I must have nodded off briefly without realizing I’d done so, and was subsequently thrown by the unconventional way that the Great Birnam Wood prophecy is handled. This error doesn’t materially affect my opinion of the film as a whole, but I apologize for it nonetheless.